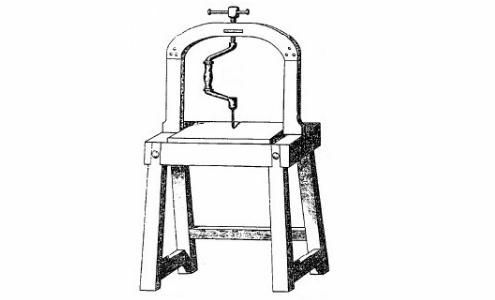 In keeping with the “unplugged” motif, I want to build a hand crank drill press like the one reportedly depicted in Siever’s ‘Il Pianoforte…’ 1868. This is most likely a late 18th or very early 19th century design given the fact that steam power was available way before 1868. I’m trying to find more information, photos, and/or drawings on this particular press or perhaps one similar. I have found several variations using “egg beaters” and the like, but I would really like to stay with the brace design. Any insight would be greatly appreciated … thanks in advance! The only thing I worry about the design above is that you still have to manually insure that the drill is vertical which is the main reason I use my drill press on wood. Without that, you might as well just use a regular hand brace. Unless you are drilling metal with a hand brace, I don’t see much advantage to having a press for wood. 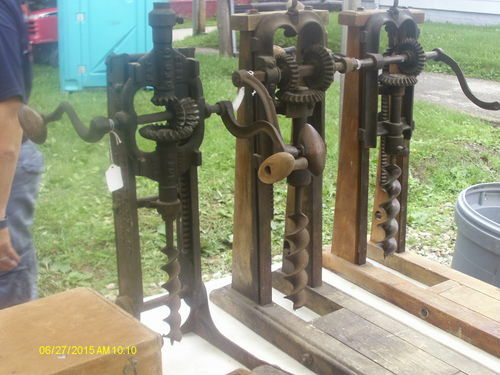 There are some vintage hand powered drill presses available on eBay and I occasionally see them on my local Craig’s List , though they tend to list for as much as a powered one. A quick search and I found this link with some examples that might be worth considering. About half way down the page there is a design that has the 2 vertical rods to guide the press. Perhaps you could could adapt the above design to incorporate this feature somehow? Lazyman – That concerned me as well. Perhaps this could be aleviated with the addition of a sliding frame to hold the brace (?). The version on the left doesn’t give you much height to work with but is the simpler design to implement. 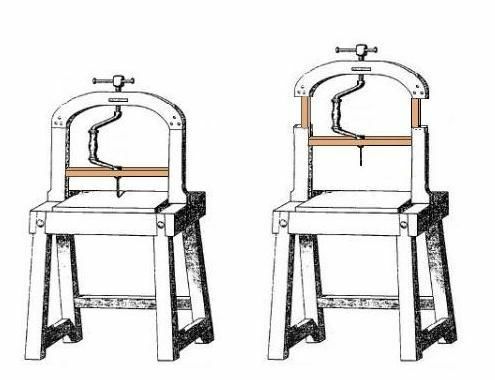 You obviously would have to modify the press mechanism on the version on the right so that it pulls down from the base (or somehow locks the sliding frame in place and use the top screw). Perhaps if the sliding pieces extended through the base, you could attach them to a foot pedal that uses a fulcrum rather than a screw to provide the press leverage. If it was spring loaded or counter weighted, it might also be made to retract the bit as well. 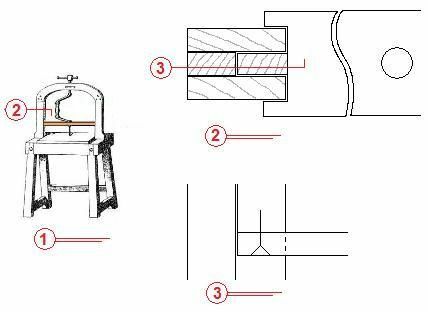 The foot pedal approach would also free up a hand to help work the drill or hold the piece you are drilling. 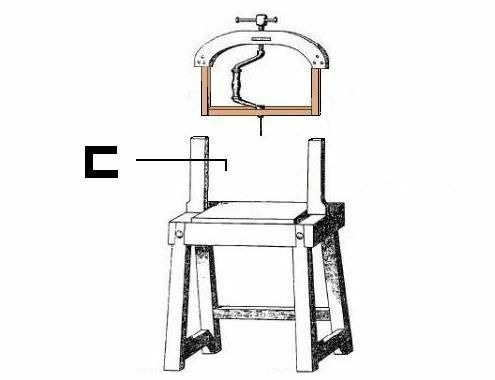 The press mechanism would have to designed in such as a way as to prevent racking as you press down on it. Another thought would be to find a broken planer on the cheap and retask the height adjustment mechanism to work the press mechansim. Just thinking out loud. … if we keep this up I won’t need to find plans! Got it! The design process is half the fun! I like making but designing is what really makes it fun for me. Instead of a square track, a V-shaped track might work better. I think that this might help reduce the chance of racking as it slides? I saw this approach in a router lift design in Shopnotes magazine. It also provided a way to fine tune the alignment of the track to make it slide smoothly and perfectly straight but if they are long enough that might not be necessary. Maybe a trunion of some sort to drill diagonal holes? Very interested thread / discussion. Nothing to contribute, but love the concept! EDIT: Scratch the ‘no contribute’ line… I’m wondering if there shouldn’t be some kind of foot-actuated control / riser that allows the brace ‘carriage’ to be lowered with intent. That would keep one hand free to hold the workpiece (the other being busy turning the brace). Either that, or the carriage has to be spring loaded so the foot lever pulls it down to the work. Maybe build one of these? EDIT: Scratch the no contribute line… I m wondering if there shouldn t be some kind of foot-actuated control / riser that allows the brace carriage to be lowered with intent. That would keep one hand free to hold the workpiece (the other being busy turning the brace). Either that, or the carriage has to be spring loaded so the foot lever pulls it down to the work. I’m actually working on that now … rope attached to foot pedal running inside the side channel pieces secured to the frame surrounding the brace. So far no “spring back” mechanism … but I’m thinking about a spring pole attached to the ceiling!! Bandit571 – Too much metal, takes two hands, too portable … and besides … where is the brace? Remember I want to keep the brace! I was going to suggest the same thing that Bandit did. I have one of those that I found in my father-in-law’s barn, and it works great. It doesn’t take up a huge amount of space, and can be clamped down if needed. The blacksmith shop at Old Sturbridge Village has a cool beam-type drill press that uses sliding weights to keep pressure on the drill. I know a tinsmith/blacksmith who works there, and he said it works really well on metal. It does take up a lot of space though. I’ll look through some of my books and see if I can find anything on treadle-driven brace type drills. Something like that does seem like it’d be a happy medium between the two. Thanks, Elroy … I look forward to seeing what you find! I just left the shop having cut out the members for the sliding carriage as depicted above. I used some 4/4 sassafras … sure does smell nice … masks the smell of the machine oil on the brace! !